The composer's first name is not "Guiseppe". (ger)Der Vorname des Komponisten lautet nicht "Guiseppe". Conferència: Wagner versus Verdi: Parsifal i Falstaff. Dins el cicle "Els adéus. Testaments i comiats de grans compositors". Giuseppe Verdi is currently considered a "single author." If one or more works are by a distinct, homonymous authors, go ahead and split the author. 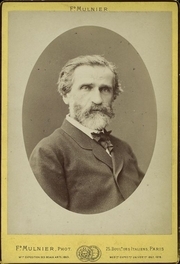 Giuseppe Verdi is composed of 13 names. You can examine and separate out names.